I never owned a DSi. When Nintendo announced it, I thought the idea was good, but it was too pricey for me at the time. DSiWare was the one thing about the DSi that appealed to me, and I hated that I wasn't going to get to experience it. Enter the 3DS and the June 6 update, which included almost every DSiWare title available. When the 3DS eShop went live, I immediately made out a wish-list of DSiWare games I wanted to buy. 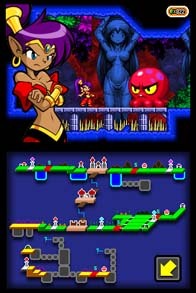 On the top of my list was Shantae: Risky's Revenge by WayForward. At 1200 points (or $11.99 plus tax in the eShop), it tops out as the most expensive game available on the service. Is it worth it? In short, absolutely. 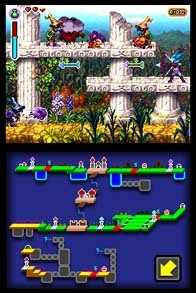 Handheld platforming doesn't get much better than this. I'm not familiar with the original Shantae (please Capcom/WayForward make it happen on the VC), but the story goes as such: Shantae's uncle, Mimic, finds an oil lamp encased in stone. Harmless enough, right? Well, Risky Boots, Shantae's nemesis, steals it. Risky knows that the lamp houses great power if combined with the three magic seals, as does her uncle. The only chance they have to save Sequin Land from Risky's scheme is to find the three seals before Risky Boots and destroy them. The gameplay feels is very similar to Metroid, in that you traverse an overworld, collect power-ups that give you the ability to get to new areas and continue progressing. Shantae's power-ups are different though. By holding the X button, Shantae begins a belly dance and can transform into a monkey (for climbimg walls and jumping higher), an elephant (stomping and charging) or a mermaid (to swim) depending on when you release it. Note that you can't transform until you find these power-ups, though are essential to progressing so you won't miss them. You can also buy various magic spells in Scuttle Town to give Shantae an advantage against Risky's crew. The spells range from fireballs to storm clouds to spinning balls. Some just cost money (dropped by enemies and in some treasure chests), but some require some case and Magic Jams, which are scattered throughout Sequin Land. Some are hard to find, and you may need to do a little backtracking to find them all, but it's worth the effort. Controlling Shantae is easy and they are spot on. Move with the d-pad (I guess you can use the circle pad on the 3DS, but I didn't try), attack with the Y button, jump by pressing the B button, hold X to belly dance, and press the R button to use a magic spell. You can do a backwards dash by pressing the L button, which is helpful in evading some enemy's attacks. The A button is primarily used for scrolling text when talking to the people in Sequin Land or various other actions. Auto run is enabled by default, and you can toggle this on or off by pressing select. Other moves come into play as you progress, but these give you an idea of how the controls work. Graphically, the game is gorgeous. The colorful graphics remind me a lot of a late-era Super Nintendo game. Shantae and her foes all animate very fluidly, and I never noticed a dip in the frame rate. The music is pleasant, and all of the sound effects are appropriate. If I had one gripe about Shantae, it would be the map. Navigating in some areas can be a bit confusing, and the map isn't very helpful in some of those situations. It's a small gripe, but probably the only one I have. Overall, Risky's Revenge is a fine platformer that isn't too long, but is an absolute joy to play while it lasts (in finding all items, it took me a hair under six hours). I highly recommend this one. Aw yeah! Shantae: Risky's Revenge is a blast. WayForward at the top of their game. Nice review. The game gets better and better as you progress...so much so, that I was left wanting more! Here's to hoping for more Shantae in the future. Haha, did you just bump the score up half a point? I guess this is what happens when you overrate Super Mario Land: you don't have a choice but to give anything much better the highest honor! We need more room to play with and crank this one up to 11. Definitely on my to buy list. A part of me wants to hold out and wait for the GBC VC game first, but who knows if/when that is coming. I have to admit, when I started the game, I was totally lost, and it took me about an hour catching up with the story of the first game on wikipedia before I got what was going on in Risky's Revenge's opening. The web of relationships in that game is so entangled, it takes a couple of playthroughs to sort it all out. Great game. This and Contra IV convinced me that WayForward, at the top of their game, are at the top of the game. The game game, I mean. Anyway, my one real gripe about this game is that the progression is a bit confusing. I would strongly urge prospective buyers to consult a FAQ as SOON as they get lost, to avoid wandering around for two hours. Everything else about the game is pure quality. Love the writing, too. I bumped it up from 9.5 to 10 because when I wrote the review, I realized my one gripe didn't deter any enjoyment from the game. It's not perfect, but it's dang good. For the price, it's a great value. It's always good to hear a lot of positive things about this game. I was always aware of this game's praise, but I never really looked at looked at what kinds of gameplay elements it incorporates. It's cool to see a DSiWare this good, and I can't wait to play it myself now that I have 3DS eShop, though I really would love to play the original GBC version too, just like @Zero. Ludist, it seems you're pretty satisfied with the combat as well as platforming. Good stuff. Nintendo needs to release the first one on the 3DS VC now, so I can play this one later. Great review, just managed to get 6000 points at 66% off so this will be one I am picking up. An offer on an online store here in the UK. It seems the price for online points is plummeting, I don't know if retailers think they are becoming obsolete due to the new 3DS points but they are really dropping in price, far cheaper than they are via the DSiWare store anyway. Apart from Plants vs. Zombies, I think Shantae may be the best downloadable game I've ever purchased. Wish they were all this good! Nice review. I never had a DSi and don't have a 3DS yet, but Shantae will be among the first games to download on the 3DS. To be more specific, the game is a Metroidvania game but unlike Metroid and Castlevania, it doesn't really let you know where you have been and where you haven't been. So when you get a new upgrade, instead of checking your map to see the places where you got to but couldn't progress any further (which are usually the next places to go), you basically get to run all over the damn place looking for the next place you can go. To make it even worse, the caves don't show up on the map and there are no maps for the areas inside of the caves, so if you kind of think you're supposed to be in a cave somewhere (which is more often than not), you need to run around until you stumble upon them again and then hope you find the one you're vaguely remembering. It's annoying, and it has made me turn to Gamefaqs a lot simply to save the time of running all over the place. Otherwise though, excellent game. Controls are tight, design is tight, abilities are fun to play around with. Graphics are surprisingly good for a DSiWare game, up there with retail games. Probably the best Metroidvania I've played besides Metroid and Vania. I agree, though the map didn't keep me from enjoying the game one bit. It's the best DSi game that I've played thus far, and I wager that it's better than most DS games out there. Everyone should buy and play this. Great bang for your buck. Anyone else got a message from Wayforward? Sounds like the game is being ported to iOS. Good for WayfForward. Though any DS owner getting this on iOS instead is a moron! Ugh. Playing such a wonderful game with a crappy virtual d-pad would be a crime. Double ugh. That card is pretty hilarious, though.